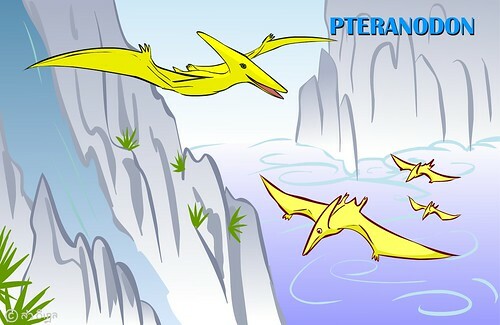 Pterodactyl” is the nickname of Pteranodon, which means Pteranodon mixing with other kind of Pterosaur. Although Pteranodon was not the biggest flying dinosaur, it is the most famous among all Pterosaur, because of an outstanding head shape, which might contain a big brain. This is also the reason, we believe that Pteranodon is one of the most intelligent dinosaur. Roll mouse over the small dinosaur, you will see the information. Roll mouse over the big dinosaur, you will see how it fly.